Mixed Salad Annie: A Day of Favorites! 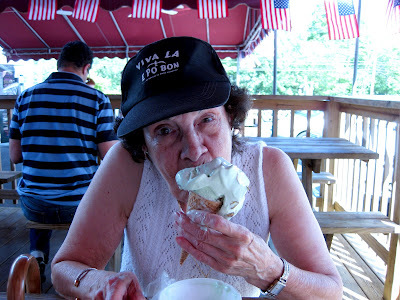 One day during my vacation I brought my mom out for some of her favorite things to eat. So of course that would include lobster. 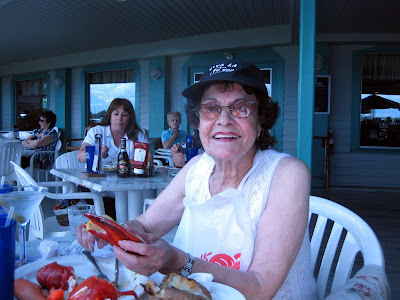 We went to Chelo's on the Waterfront in East Greenwich. They just happened to have a special going on that day; twin lobsters for $29.99. Not bad! And you can see her favorite drink to the left, a dry martini, no ice with a green olive. She usually adds a little water to it to dilute it a bit. There was a live band which were pretty good and we had a great time. 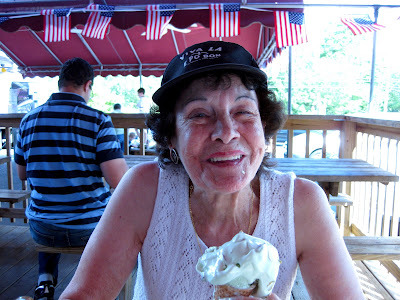 Of course the other summer must have in Rhode Island is homemade ice cream. We all have our favorites, but this time we ended up at an old favorite from years ago. In fact, it had been so long since I'd been that I wasn't even sure if they were still open. 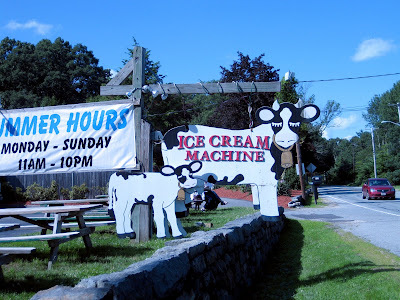 But to my delight, the Ice Cream Machine in Cumberland is still churning out some of the areas best ice cream! It is located on Diamond Hill Rd. right across from Diamond Hill Park. 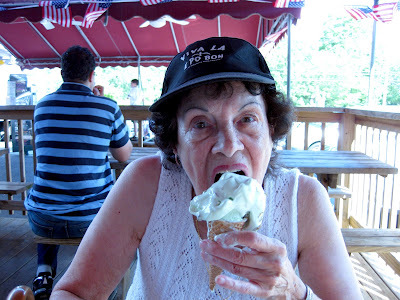 My mom had her favorite; pistachio. Hurry Mom get it before it melts! There's just something about ice cream that brings the kid out in all of us! I hope you enjoyed this cook free/recipe free post! And I hope you are all enjoying your favorite things this summer!! Looks like y'all are having a good time. I just love your mom...she's too cute! I DID enjoy this post! This looks like such a fun time. Your mom is such a cutie! I'm very hungry for ice cream now. Lobster and pistachio ice cream - if there's a more perfect meal than that, I don't know it! 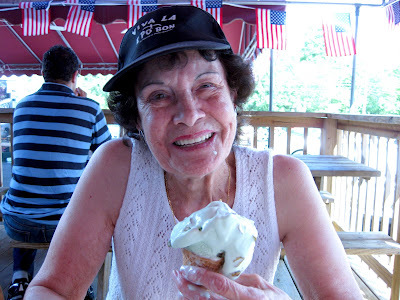 And your mom is adorable - I love seeing her attack that ice cream! Everything was delicious the food,the view,the music and of course the ice was really good thank you Annie,bambola.